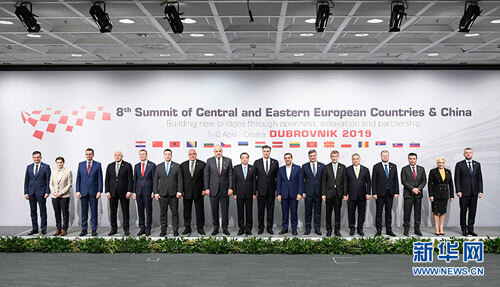 On April 12, 2019 local time, Premier Li Keqiang attended the 8th Summit of China and Central and Eastern European Countries (CEEC) in Dubrovnik with leaders of the CEECs. Prime Minister Andrej Plenković of Croatia chaired the summit. Greece was welcome to join as a full member of China-CEEC cooperation at the summit. The European Union (EU), Austria, Belarus, Switzerland and the European Bank for Reconstruction and Development sent representatives to attend the summit as observers. In his speech, Li Keqiang spoke positively of the achievements of China-CEEC cooperation in the past year. He expressed that not long ago, President Xi Jinping paid a successful visit to three European countries, lending fresh impetus to deepening China-EU comprehensive strategic partnership. The 21st China-EU Leaders' Meeting was successfully held the other day, and China and the EU issued a content-rich joint statement. As a part of China-EU relations, China-CEEC cooperation has been conducive to promoting the European integration process and the development of China-EU relations. Li Keqiang pointed out that China-CEEC cooperation has followed the principle of mutual respect and equality, embraced the spirit of openness and inclusiveness, adhered to internationally recognized rules as well as EU laws and regulations, and respected the responsibilities and obligations of the CEECs which are also EU members. We have given equal importance to trade and investment, and advanced economic cooperation and people-to-people exchanges in parallel, The China-CEEC cooperation has promoted the common development of all participating countries, and contributed to more balanced development in Europe, providing an important underpinning for all-round cooperation between China and Europe. Li Keqiang noted that the theme of the summit is "Building New Bridges Through Openness, Innovation and Partnership". We should build the bridges through greater openness, build the bridges through unimpeded innovation and build the bridges through stronger partnership. We should jointly uphold the multilateral trading system, adhere to the fundamental principles such as openness, transparency, inclusiveness and non-discrimination, and insist on the direction of trade liberalization. We should further expand our trade volume. The Chinese side is willing to import more specialty and quality agricultural products from the CEECs and facilitate the export of high-quality agricultural products from the CEECs to China. We should promote cooperation on the development of the Belt and Road Initiative. We are willing to strengthen the alignment of development strategies with the CEECs and other European countries and uphold the principle of extensive consultation, joint contribution and shared benefits to better leverage our comparative strengths and achieve win-win cooperation and common prosperity. We should step up efforts to expand innovation cooperation. The Chinese side will work with the governments of the CEECs to carry out joint research, expand scientific and technological exchanges, nurture new growth areas for innovation cooperation, and jointly maintain a fair, just and non-discriminatory market environment. We should continue to advance cooperation between our small and medium-sized enterprises (SMEs) and on industrial park construction. We held China-CEEC SMEs Cross-Border Matchmaking Event, and launched the website of China-CEEC Coordination Mechanism for SMEs, hoping to achieve more cooperation results. We should deepen people-to-people and cultural exchanges and cooperation. We should take the holding of the China-CEEC Education and Youth Exchange Year as an opportunity to strengthen exchanges and cooperation among universities and enhance mutual understanding and friendship between young people. Li Keqiang announced that the Chinese side will host the 9th China-CEEC Summit next year. It is expected that leaders of the CEECs will come to China to attend the summit, and jointly map out a new blueprint for the future development of China-CEEC cooperation. Leaders of the CEECs attending the summit noted that since the establishment of the CEEC-China cooperation mechanism, the CEECs and China have seen their practical cooperation bearing remarkable fruits, political mutual trust continuously strengthened, trade and investment rapidly growing, cooperation in fields including education, tourism and culture continuously deepened and the range of cooperation expanded. The cooperation mechanism has continuously shown new vigor and vitality and become an important cross-regional cooperation platform featuring openness, inclusiveness, mutual benefit and win-win results. The mechanism has not only boosted economic growth of each country and enhanced the wellbeing of their people, but also effectively promoted the overall Europe-China relations. All sides are ready to take this summit as an opportunity to fully support the implementation of CEEC-China cooperation projects, further promote connectivity and infrastructure construction, actively participate in the joint building of the Belt and Road Initiative, continuously expand trade volume, jointly safeguard multilateralism and free trade, increase personnel exchanges, expand exchanges and cooperation at local levels and in fields including tourism, health, sports, and think tanks, consolidate the public opinion foundation, and promote the development of partnership between the two sides, in a bid to promote regional and world stability and development. After the summit, China and the CEECs jointly issued the Dubrovnik Guidelines for Cooperation between China and Central and Eastern European Countries. Leaders of all countries witnessed the signing of more than 10 bilateral cooperation documents. Wang Yi and He Lifeng attended relevant activities. On the evening of April 11, 2019 local time, Li Keqiang and leaders of the CEECs attended a welcome ceremony held by Prime Minister Andrej Plenković of Croatia at the Old Town of Dubrovnik.